The Indiana Pacers have now gone four straight years without reaching the playoffs. The 2009-2010 Pacers finished 32-50, which was their worst record since 1989. The front office has been planning ahead for the 2011-12 season for quite some time, since they have many contracts coming off the books after this year. Fans are holding out hope that the future will be brighter. This appears to be a season where a transition to better things may begin, but the progress will likely be fairly slow. It took a while for the Pacers to do anything this offseason, but they finally made a big splash in August by acquiring Darren Collison. For the last few years, the real need in Indiana has been a solid point guard to run the show, and now they finally have their man. Collison looked great in his time with the Hornets last year, and I fully expect him to be one of the better point guards in the league over the long run. In the NBA Draft, the Pacers snagged Paul George with the 10th overall pick. George is a bit of a gamble, but he has great skills and has the chance to be a star. I think the Pacers did a nice job landing Lance Stephenson in the second round. Stephenson has wowed many scouts in Summer League action, and he could end up proving to be a great value pick. The outlook was quite dim in August before the deal for Collison, but now many experts are saying this team could reach the playoffs in the Eastern Conference this year. Even with a new point guard, there are several areas that need significant improvement. The Pacers absolutely must play better defense. The coaching staff talked about an increase importance on defense last year, but it never showed on the court. Their opposition averaged 103.8 points per game last year. 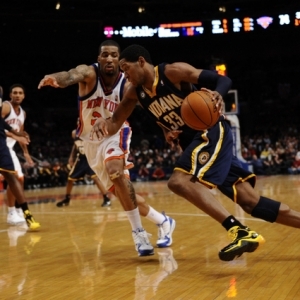 Danny Granger is still the main man for this team, but he actually took a small step backward last year. Granger turned the ball over 2.5 times per game last year, and his field goal percentage dropped noticeably. The power forward spot is the biggest question mark for this team. Tyler Hansbrough is the best option, but he is still dealing with inner ear issues and his status is unclear. Josh McRoberts is currently slated to be the starter, which means the spot could be a weakness for the Pacers. Roy Hibbert is a nice young center that appears ready to break out, but Indiana needs him to improve on the glass. The Pacers had the second worst rebounding margin in the entire NBA last season. The Indiana Pacers schedule has been released, and they start out on the road in San Antonio on Oct. 27. The Washington Wizards will come to Conseco Fieldhouse to play the Pacers on New Year’s Eve in what should be an interesting matchup with John Wall and the talented young Wizards. The Pacers get the benefit of having six of their final eight regular season games at home. A team like the Pacers doesn’t have much hope at all to win the NBA Title, and the books know it. BetUS lists the Pacers at +12,000 to win the championship this year. The Pacers are listed at +3,000 to reach the Eastern Conference Finals, and +8,000 to win the Eastern Conference. The Eastern Conference got much tougher this year, so the oddsmakers have accordingly lowered the chances of an upset winner in the conference. The Pacers will be an interesting team to keep an eye on this year, but I just don’t think they are deep enough to make a playoff run. The backcourt is much better with Collison, but rebounding is likely to be a major issue for this team. Guys like Mike Dunleavy and Brandon Rush will need to step up and stay healthy this year. I think there is a good chance the Pacers will get to 36 or 38 wins, which would be a decent improvement from last year. Should you be looking to put your money to work on the Pacers this year? I definitely would not. I really don’t think this team has any chance of going anywhere if they do get into the playoffs. You can’t be this thin on the interior and expect to contend for the Eastern Conference crown. Allen Eastman was the Doc’s Sports Advisory Board leader for NBA picks last season, helping $100 bettors earn more than $5,000. His picks will be available starting Tuesday, Oct. 26. Eastman has been in the sports betting business for decades and his NBA handicapping system is a must for any NBA bettor that is serious about making money this season. Early Bird specials will be posted soon, so check our homepage regularly. Also, check our home page daily updated NBA lines, NBA betting articles and daily matchup reports.